Group Visits: If you wish to organise a group visit to Twyford Meads or for a printable version of the text below or for a document linking to the National Curriculum please see end of this page. Ragwort Pull: Pease help by volunteering to join summer ragwort pulls usually in June and July. Information will be published before the event. Open Days & Floodings: Floodings are planned, normally in the spring but this depends on water levels and other factors at the time. Twyford Meads is about three miles south of Winchester in the Parish of Twyford. It is open to visitors at all times, access being on foot only by various footpaths. For visitors who are not local it is suggested that if you are using private transport you park at the end of Church Lane, Twyford adjacent to the Parish Church. From there a footpath leads down hill and across a footbridge over the River Itchen. At the other side of the river take the right hand fork in the path and visitors enter Twyford Meads at the far end of that field. Visitors using public transport are recommended to take the train to Shawford Station. Just downhill from the station the road crosses the Itchen Navigation and the adjacent towpath is a footpath signed “The Itchen Way”. Take that path north for half a mile to Twyford Meads. The management of the site includes occasional grazing by cows. Teachers arranging visits are reminded of the need to observe certain safety precautions. Teachers are also reminded that the site is unsupervised and that the streams crossing the site and the adjacent Itchen Navigation are not fenced off. In particular the Itchen Navigation is several feet deep in places and can be fast flowing. As access to the site is by footpath across agricultural land consideration should be given to appropriate footwear. Wellington Boots are most appropriate during winter months. The owner of the site Twyford Parish Council is keen to encourage visitors both for leisure and education purposes. Teachers wishing to arrange educational visits are asked to contact either Jonathon McGill on 01962 714560 or David Owen on 01962 713271. As access is permitted at all times teachers can make their own arrangements to visit and do not need to be accompanied by a representative of the Parish Council. Teachers who would prefer an accompanied visit should contact one of the persons named above. Depending on the season it will often be possible to make a visit more interesting by including a short demonstration of how the flow of water can be diverted to start flooding each section of the meadow. 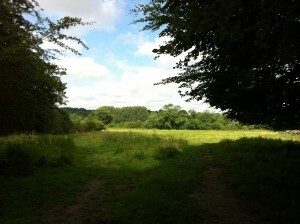 From around the 17th century until the 1930s, large sections of the Itchen Valley were farmed as water meadows. Here, at Twyford Meads, a leat takes water from the Itchen Navigation and is then channelled across the meadows by a series of carriers running along the top of the ridges. The water flow and levels can be carefully controlled by a system of hatches and sluices, the workers managing the meadow being called “drowners”. To flood parts of the meadow, they would place turf sods into the carrier channel to overflow that section of the ridge. This caused the water to trickle down the banks and at the bottom of each ridge a drainage channel took the water back to a main drain and eventually to the River Itchen. This process was known as “floating” and would start each year in late winter. It encouraged the early and rapid spring growth of the grass (by raising the temperature of the soil insulating the grass from frost), while spreading useful silt and nutrients across the meadow. This very labour intensive form of land management made it possible to produce two hay crops a year in addition to periodic grazing by cattle and sheep. Three ancient footpath systems converge at Twyford Meads. They come from the downland and villages to the east and west, while the towpath of the Itchen Navigation connects Southampton to Winchester. Local people have used the lock for swimming for as long as anyone can remember. Additionally the Parish Council permits access to the whole of the site. To improve access, works have been carried out including new footbridges and the replacement of styles by kissing gates. There is an ongoing programme of environmental works including pollarding old trees and replanting hedgerows. The management of the site includes the control of weeds by approved methods under the guidance of the Countryside Stewardship Scheme and English Nature. Cows and sheep graze the site for short periods. The section of meadow close to this information board has been restored as an example of part of a working water meadow. The main leat channel has been re-dug with the existing bridge over the main drain being extensively rebuilt. A new bridge has been constructed to connect the leat channel to the higher level water meadow carriers. The brickwork has been constructed to allow wooden sluices to be inserted. These can reduce the direct flow to the main drain and divert the water to the higher level carriers. Various small brick and timber structures set in the meadow enable the flow to be controlled to the different carriers and drains, making it possible for controlled flooding of this section of the meadow. The Itchen Navigation, running from Woodmill in Southampton to Winchester, was constructed following an Act of Parliament of 1665. This enabled navigation up the valley, as far as Winchester, for shallow draft barges 14 feet wide and about 70 feet long. A horse towing path ran the full length of the navigation and there were 15 locks mainly constructed with turf sides. One was Compton Lock, (formerly also known as Twyford Lock), which is on the west side of Twyford Meads. The old lock is almost circular and the lock gates have been replaced by the weir and footbridge. Commercial traffic on the navigation ended in 1869. The navigation was constructed after the water meadows and Shawford Mill were built and is the feeder to both. There were regular disputes over water rights and the ownership of the navigation. The Itchen Navigation and River Itchen hold a thriving population of fish, particularly brown trout, grayling, pike, eels and minnows and is of international importance for its’ floating vegetations and Southern Damselfly populations. The River is designated a candidate Special Area of Conservation under the European Habitats Directive. The River Itchen together with The Itchen Navigation and some of the larger carriers are home to a number of fish species particularly brown trout, grayling, pike, eels and minnows. Twyford Parish Council own the fishing rights on the east bank of that section of the Itchen Navigation that is adjacent to Twyford Meads. In an effort to protect the fish stocks and reduce environmental damage to the river and banks, the parish council have now restricted angling on this stretch to local residents of the parishes of Twyford, Shawford and Compton. All anglers must abide by national Environment Agency laws and must carry a valid fishing licence which can be obtained from any local post office. Group visits are welcome, schools, photographic, fishing clubs, twinning, ramblers etc. There is a Natural England form to complete after a guided visit. This form is very important to us as it gives access to grants through the Countryside Stewardship scheme to help maintain the site, a big thank you to all who complete it. Group visit form forms (available from the Parish Clerk) should be returned to the Parish Clerk. Twyford Meads Guide – a two page version of the guide without the photographs.